A perfect summer sweet treat. 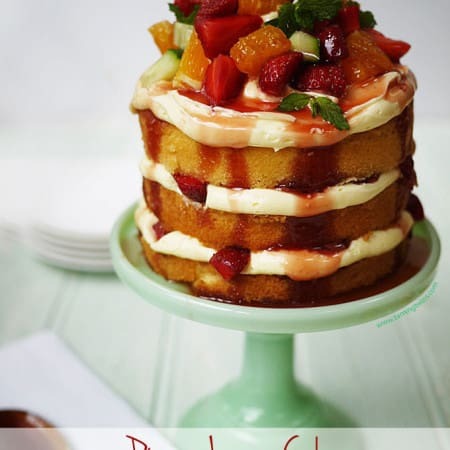 A layer cake drenched in Pimms and fresh fruit. Mix in your flour and lemon zest. If you’ve been using a mixer, do this bit by hand. It helps to keep the sponge light. Pop the Pimms in a pan with the sugar and bring to the boil. Continue to let it bubble for about 6 or 7 minutes until it has thickened. Allow to cool (it will get thicker as it cools). Beat your butter until it’s pale, light and fluffy. Beat in your icing sugar, beating for at leave 5 or 10 minutes until very fluffy and pale. Mix in the lemon extract and cream cheese if using. When your cakes are completely cold, use a carving knife to level them. Just trim the top crust off. This is important, it’s not a waste of cake (taste testing compulsory). If you don’t do this, with a cake this size it will be wonky. Drizzle a couple of dessert spoonfuls of syrup over each layer of sponge cake. Sandwich each layer together with some of your buttercream and some of the fruit (reserving plenty of fruit, and the mint, for the top). Put a dollop of icing on top of the cake and pile on the fruit. Drizzle the remaining syrup and decorate with mint leaves.